He caminado mucho por la geografìa colombina y he podido admirar muchos pájaros..pero esta colecciòn me deja perplejo..felicitaciones y gracias por compartirla..
Would like to see a Green and White Hummingbird. thank you. wondeful photographs. 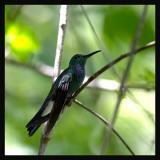 You have a great variety of hummingbirds. The colors are amazing.